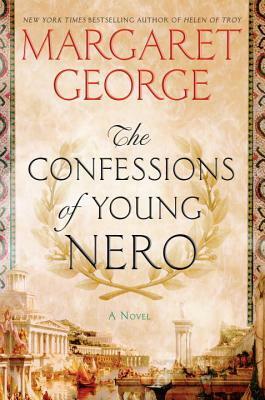 The Confessions of Young Nero by Margaret George releases today in the US and on March 9th in the UK. What does it take to write such a novel? How does an author feel about her very real character? I’ll turn it over to Margaret to enlighten us all. What is it about the men I take up with? First Henry VIII, now Nero? One was known as a gross man who killed his wives, the other as a guy in a toga fiddling while Rome burned. Why was I attracted to them with this—fatal attraction? Of course, because they are both long gone from this earth, I am in no actual mortal danger from keeping company with them. But as a writer it’s a different story. All writers can attest to the allure of their subjects, the Pygmalion effect of falling in love with what you have created. In the case of writing about a real person, but fictionalized at a distance of centuries through my own imagination, where does the creation part leave off and the real begin? In short, is it really possible to come to know a historical character through art in a way you cannot through scholarship? Part of the adventure of being a historical novelist is the opportunity to explore the past in a way that others don’t get to. Even if it is in your own mind, when you go to a museum exhibit on your character, you feel like his special guest, not one of those clueless tourists. After awhile you feel he knows you personally, and gradually you get to know him personally, and pretty soon you have a ‘special relationship.’ At least that’s the way it feels. As time goes on and you have embarked on writing about him, spending several hours a day in his company, you find to your distress that somewhere along the line you have joined some weird fan club. When you see his name in a modern ad, you feel defensive. (There was an underwear ad of someone wearing boxer shorts playing the violin, and the caption was “Make like Nero in your Fruit of the Looms!”) I felt embarrassed for the poor emperor, I wanted to protect him from such insults, and furthermore felt that I owed it to him to do so. The condition progresses, as addictions do, and pretty soon you feel possessive of him in a territorial sort of way. Let no one else be writing about him! They can’t possibly understand him! Go away, don’t trespass! He’s mine! Now in any other profession—except maybe acting—this would qualify as a real delusion. But perhaps we need to go through this phase in order to bond to the person tightly enough to write well about him. To be jealous of anyone else he’s spending time with, or vice versa. To think about him constantly. Then at last comes the day when the book is finished. Others will see it, will read it, and—horrors!—might say insulting things about my emperor. Once again, the need to shield him lest his feelings are hurt. Unlike a totally fictional character, created entirely by you—copyright from your own head—a historical one has outsiders knowing plenty about him, and having opinions about him before they read even a word of your book. Here are some things known about Nero. Qualis artifex pereo! What an artist the world is losing! The supposed last words of the emperor Nero, fifth emperor of Rome, the last of the Julio-Claudian dynasty, and darling of cartoonists, have resounded down the ages. But what did he mean when he said them? And what sort of an emperor was he? He has been blamed for setting Rome on fire and fiddling while he did it, for sleeping with his mother and then murdering her, for persecuting the Christians, for neglecting his duties to act on stage and sing and drive chariots. Now why would the world be fascinated with such a creature and why would I want to write about him? The paragraph above omits the other side of the equation: a teenager when he became emperor and ruled for 14 years, prosperous years for the Roman Empire, he won the battle for Britain against the great warrior queen Boudicca, keeping it firmly in the Roman orbit, concluded a peace treaty with Parthia, Rome’s perpetual enemy, by diplomacy not warfare, that lasted 60 years. He embarked on ambitious engineering projects: a new harbor at Ostia, a canal across the isthmus of Greece, urban planning in Rome, a palace that, long before Frank Lloyd Wright, used light as an architectural element, and pioneered the type of dome that later graced the Pantheon. The music he composed was good enough to be played long after he was dead, and he even had three imposters who attempted to pass themselves off as the real Nero as long as twenty years after his death. People wanted him back! Obviously he was a complex man and, as bad luck would have it, only the histories critical of him have survived and the favorable ones are lost. So it was a challenge to look for clues to reconstruct the whole person. But even the anti-Nero histories give themselves away sometimes with little tidbits and hints of another side of the story, and modern historians are good at extracting them. So I had a lot to work with. Also, in the last decade there have been three major exhibits about Nero, two of them in Rome, and one in Germany. His Domus Aurea—Golden House—has been opened to the public and just last month was the subject of national news stories for the virtual reconstruction of it that visitors can see with special headgear. This summer in Rome a rock opera about him is being staged on the Palatine Hill, and Nero-inspired drinks are being served in restaurants and bars. (In real life, his decocta Neronis was merely melted and boiled snow. Not very exciting.) Some revisionist books have been published, including mine. So perhaps he is having his Moment. Of course, it’s hard to share him…I’m still not recovered yet. I ought to be happy for him, but…darling, wasn’t it wonderful when it was just the two of us? Sigh. Many thanks, Margaret. Your thoughts are so intriguing. Is it appropriate to wish that you find a new ‘fatal attraction’ soon? And, of course, wishing you great success with The Confessions of Young Nero. The Confessions of Young Nero by Margaret George: Built on the backs of those who fell before it, Julius Caesar’s imperial dynasty is only as strong as the next person who seeks to control it. In the Roman Empire no one is safe from the sting of betrayal: man, woman—or child.